Survivors of mother and baby homes were given clarity today on the powers that will be given to the commission of inquiry. THE TERMS OF reference announced today for the inquiry into the mother and baby homes have been broadly welcomed by groups representing the women who lived in these institutions and their children. The investigation, chaired by Judge Yvonne Murphy, will examine how the women were admitted, the treatment of women and children, the mortality rate among children and burial arrangements, among other things. It has been described, both by Minister James Reilly and representative groups, as a “wide-ranging” inquiry which will allow the commission scope to pursue a number of different avenues. Speaking after a briefing from the Minister and his advisors, survivor groups told reporters they welcomed the news, with some saying they were surprised the investigation will go so far. “We expected the worst but he [Minister Reilly] went an awful lot further than all of is thought, ” commented Paul Redmond of the Coalition of Mother and Baby Home Survivors. Overall, this has been a very, very good day for the adoption community. This is the beginning of the end. Terry Harrison gave birth to her son Niall at St Patrick’s Home on the Navan Road in Dublin in 1973, having run away from Bessboro House in Cork. My son is in his 42nd year and I live with it every single day. You think it’d get easier. It gets harder because the further the days go by against me ever, ever being able to hold my son again and give him one hug. Her son was adopted through a private adoption society run by the Catholic church, after bring taken from his cot in the Dublin home. She knows his identity but wants to leave it to him to view his open file and come to her. Today, she made an emotional plea to him. Niall, if you’re out there and you in some way know I am the women who brought you into this world, I named you ‘Cuddles’ when I carried you, I nursed you and I sang to you. I hope one day you will find it in your heart to allow me to give you one hug. Harrison said she has spoken to many women who went through the same ordeal as she did, telling reporters many of them are “terrified of showing their faces”. Minister Reilly today confirmed the inquiry will look at the cases of children who were taken from their parents and whether consent was given. In all, fourteen homes will be included, as well as a sample of county homes. This inquiry will cover the period from 1922 to 1998 but the committee will reduce the “relevant period” of a particular institution if its deems it necessary. A confidential committee will be established to allow former mother-and-baby home residents and workers to provide accounts of their experiences in private as many do not wish to make their stories public. The circumstances of how the individual women entered and left the homes and what part they played in those decisions. Their living conditions and care arrangements while residents. The mortality rate among women and children in the homes. These will be compared to mortality rates at the time. 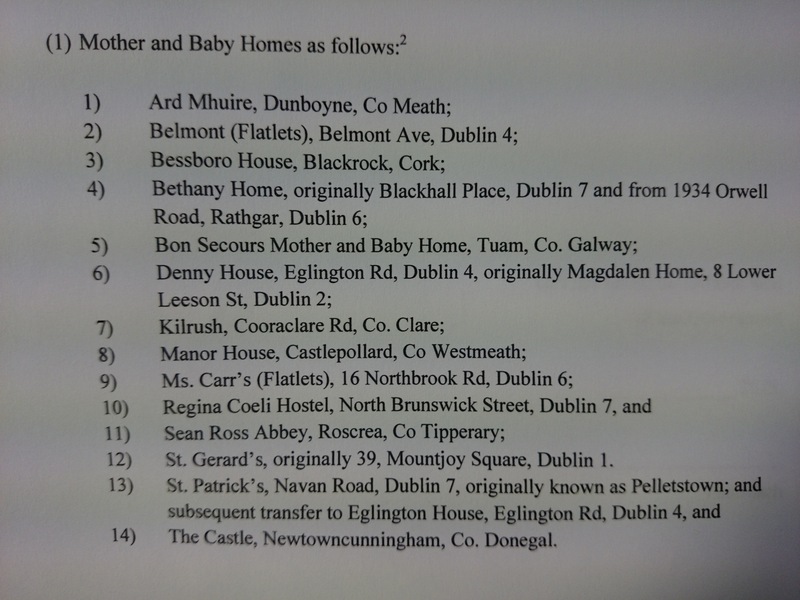 The arrangements for women and children who died in the homes. This includes burial practices, reporting of death and the transfer of some bodies to educational institutions. Importantly, the commission will have the power to compel individuals and institutions of its choosing to provide information or documentation. Today the minister indicated there would be harsh consequences for those who do not cooperate and this could include financial penalties. This commission for inquiry was first announced last June after the discovery in Tuam of a septic tank site that could hold the bodies of children born in a nearby mother-and-baby home. The scandal led to a country-wide discussion about such homes. It followed relations from local historian Catherine Corless, who today also welcomed the terms of reference. “These illegitimate children were regarded as a subspecies by all and sundry,” she said today. Just because they’re illegitimate children, doesn’t mean they should be forgotten about. There was one criticism groups had today, and that was that Magdalene Laundries would not form any significant part of the inquiry. Helen Murphy, of Remembering Bessboro Babies, said the investigation into the treatment of women at these institutions had not been satisfactory. However she said they had been assured by the minister that, as an exit point, there will be some examination of them. It was also confirmed that the commission will be able to look into homes in Northern Ireland where children from the Republic were sent after they were in a mother-and-baby home. The commission has been give three years to complete its work, and though groups acknowledged that some of those affected may not still be alive to see the outcome, most are just glad someone is finally listening to them. - With reporting by Ronan Duffy. Email “Mother and baby home survivor: My son is in his 42nd year - I might never get to hug him”. Feedback on “Mother and baby home survivor: My son is in his 42nd year - I might never get to hug him”.